When Joanne McMahon woke up from a month long coma she turned to her doctors and promised to raise money for the hospital that saved her life. The Co. Limerick woman proved to be as good as her word when she spearheaded a fundraising campaign for the National Burns Unit at St James’ Hospital Dublin. Back in June 2014, the mother-of-five was airlifted to hospital from her home in Castlemahon when a food heater exploded into a ball of flames over her. She sustained serious burns to 50% of her body at a Confirmation party for one of her children after she poured methylated spirit into the already-lit cooker which then burst into a fire ball. Flames engulfed her face, neck and hands. Joanne decided to organise cake sales, dances, cycles and concerts for 131 days which represented the time she spent in recuperation in the specialist unit. Her extraordinary efforts were rewarded when she smashed her initial €15,000 target and was able to hand over a cheque for €209,976.62 to unit director Odhran Shelley after her four month campaign. Joanne said: “It’s unbelievable. I would have been happy had we raised €30,000, but this took on a life of its own after we started last year. 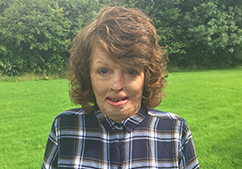 “I have to thank all the people of West Limerick, but we also got support from Auckland, Chicago and Sydney…it’s nearly impossible to thank everyone.” Joanne described Dr Shelley and the staff at the burns unit as “outstanding”.